Although we haven’t shared thousands of sweet granola bar recipes, they certainly are out there on the web for your viewing pleasure. They come with small variations – some add more ingredients; others make it simple with no baking directions, and a few even venture into exploring unexpected ingredients such as red pepper to spice things up. However, a bar recipe you haven’t seen quite enough of is the savory variety. These bars aren’t sweet based– on the contrary, they are perfect for when you crave something salty and would rather not dip your hands into a bag of junk food. A common approach to salty snacking used by those looking for better nutrient balance than that found in chips for example, is to eat mixed nuts. This is a smart choice for snacking of course, but when it comes to mixed nuts, it’s easy to overindulge and potentially end up consuming more calories than intended. Therefore, these savory type of snack bars are a fantastic solution to your salty snack demands. It is also easy to control portion size with these bars. There are currently only a couple of savory bars available on the market. The good news about these bars is they are incredibly fast to make and uncomplicated. . Also, they give you the opportunity to add your favorite flavor twists, too. The recipe shared below is for a Savory Curry Bar. It draws influences from Indian cuisine, with the addition of spices such as curry and turmeric. Curry powder is most often a mixture of coriander, turmeric, cumin, fenugreek, and chili peppers. Turmeric is an excellent source of iron and manganese. It is a good source of vitamin B6, fiber, copper and potassium as well. Rich in phytonutrients such as curcumin, demethoxycurcumin, tumerones and tumenorols, this spice offers anti-inflammatory benefits and promises a decreased cancer risk. Research has also shown its potential for improving cognitive function, blood sugar balance, kidney function and helping in the management of some arthritic and digestive disorders. Both curry and turmeric have strong and unique flavors. If you have not tried these before, I would recommend trying them first before making the recipe given below. Here is an experiment: Mix about 1/8 of a teaspoon of curry powder into plain brown rice to test if you enjoy this Southeast Asian spice. The same method can be used for the testing of turmeric alone. If you don’t enjoy these flavors, you can make the recipe below by simply skipping those spices, or substituting them with ones you actually do love. For example, a rosemary and lavender combination works well for this bar. In the video below, I go through the steps of making this bar. The trick is to adhere to the resting time in the freezer, enabling the bar to set. After making this recipe a couple of times, I noticed that the crumbles at the bottom of the container were just too good to waste. I added them to salads as toppings, and that was a genius move! Here is an idea: If you don’t want to wait for it to set in the freezer, just pour the mixture into an airtight jar and store in the refrigerator. Use it as a crunchy topping for your salads, soups or even a rice and bean bowl that calls for more flavor! The notion of “salty” bars might just be the new trend for 2017. What do you think? Let us know in the comments if you think this trend will be a winner. Mix all ingredients, in no special order! Just mix them well. It is a bit easier to start with the coconut oil and Once Again Nut Butter, and then add in the powders and next the seeds, nuts, and cereal. Once well mixed, press the mixture it onto an 8×8 baking dish. Place it in the refrigerator to set for four hours, or in the freezer for 30 minutes. Cut it into bars and enjoy! Store in refrigerator for up to seven days. You may also crumble it up and use it as a salad topping! 1 cup of puree 100% pumpkin or fig paste, date puree, or apricot puree. Mix peanut butter and pumpkin until well blended. Add stevia and pumpkin spice and combine. Slowly add in oats and cranberries. Spread the mixture in an 8×8 baking dish lined with parchment paper. Take it to a preheated oven at 350 degrees Fahrenheit for about 40 minutes. Edges will begin to brown; insert toothpick into the middle to check for readiness. Remove from oven, and let the large bar cool before cutting it up into portion-sized bars. Store them in airtight container for up to one week, or freeze for up to three months. You may also add other toppings such as chocolate chips, chopped walnuts, or raisins. Every few months it is a good idea for you to check how your fiber intake is going by totaling your daily intake. The food industry is extremely focused on protein these days (It has been for a while, and the trend doesn’t seem to be slowing down). This means that advertisement and packaging are highlighting protein content more than ever. Even cereal boxes have added bright and bold letters to the front of their boxes to call your attention to how much protein they offer up in a serving. Unfortunately, this drives us to also tune into protein intake and sometimes forget other nutrients that may be even more important. Protein is crucial. We recently broke down the importance of appropriate protein intake that we invite you to read up on here: (insert link). However, protein takes a back seat to importance in longevity and overall health when it comes to fiber. At one point in time, fiber was the hot topic. Everyone talked about it and there were even snack bars hitting the market with the word “fiber” in the brand name! Along the way, we forgot that eating enough fiber is a life-long daily ritual that we must maintain. It is important to us as children, adults, and even more as we age. Fiber is what keeps your digestive system working properly. Eating enough fiber each day is also one of the few ways to decrease your risk for chronic heart disease, Type 2 diabetes , colon cancer; it also helps you maintain a healthy body weight, among other health benefits. Americans, in general, eat enough protein: Even those following a vegan or vegetarian lifestyle generally meet their protein goals. However, people are not getting enough fiber. As a matter of fact, in a survey of 2,000 Americans, over 95% of graduate school-educated participants and health care providers weren’t even aware of their daily recommended fiber intake. The Institute of Medicine recommends 38 grams for men 50 years of age and younger, and 30 grams for men over 50 years old. Women 50 years old and younger should get 25 grams, and those older than 50 should get 21 grams. Keep in mind these levels represent minimum requirements. Shockingly, The Institute of Medicine reports that on average Americans are getting barely 50 percent of their daily fiber requirements. . Fiber can only be found in plants. Animal products have no fiber at all! This sounds obvious, but many people fail to grasp this simple fact.. Once you connect the dots the answer is quite simple: Eat more plants! That is the only and most efficient way to ensure an adequate daily fiber intake. Simply put, increase your intake of whole grains, legumes, nuts, fruits and vegetables! If you aren’t sure how much you are eating each day, it is a good idea to keep a food journal for three consecutive days. Then go back and using a credible app or website For example: Calorie King, the American Heart Association, the American Diabetes Association. Look up the fiber content of your recorded food and do the math. Are you reaching your daily goals on a consistent basis? If not, then make some changes right away. Remember to swap refined carbohydrates for whole grains, which means, get rid of the white bread and pasta and substitute for quinoa, oats, amaranth or other fiber rich complex carbohydrates. Add more fruits and vegetables throughout your day. Make them your go-to choices for snacks. Take several small steps at a time; try to increase intake only 5 grams of fiber every few days, while also increasing your water intake. Allow your digestive system to adjust, and it will perform better in the long run. Then sit back and enjoy the benefits of a fiber- rich diet! Our recipe here is for cookies. How can that be a part of our “eat more fiber” blog today? Well, I strongly believe in no missed opportunities when it comes to the food we eat. Cookies are a delicious treat that makes their way into our diets every now and again. When they do, it is best if they are homemade with ingredients that will add to your nutrient intake versus set you back on your health goals. These Peanut Butter Oatmeal Cookies have no refined white flour. They are made simply with oat flour and whole oats. They also have cranberries and peanut butter which contain fiber as well. You can use regular eggs or the flax-eggs (For each egg, combine 1 tablespoon of ground flax seed -measure after grinding- with 3 tablespoons of water. Stir well, and place in the fridge to set for 15 minutes. After 15 minutes, the result should be a sticky egg-like substitute which also contributes to your fiber goals. Remember the animal egg has no fiber ! Let us know if you liked this recipe in the comments section below. 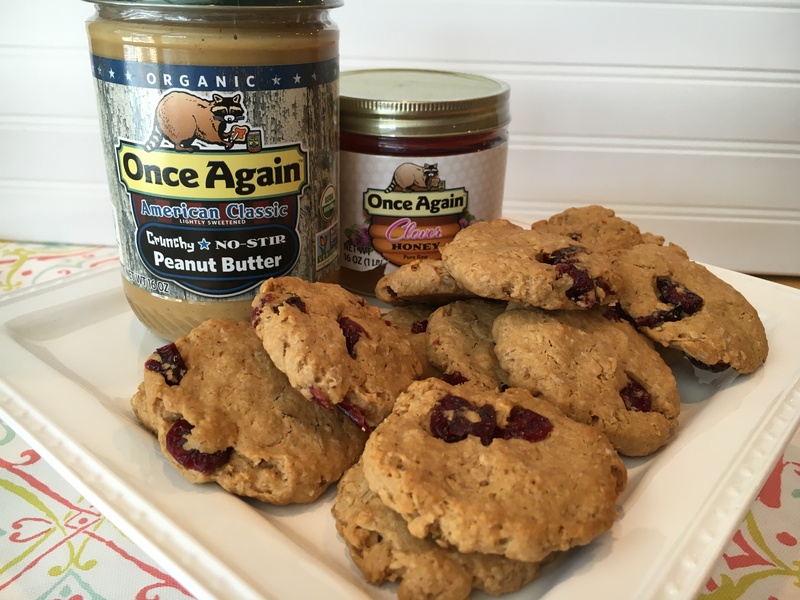 Also, if you make these cookies share a picture with us on our Instagram, Facebook or Twitter with the #onceagainnutbutter and tag us. Combine oat flour, baking soda and baking powder. Set aside. In a separate bowl, mix in eggs (at room temperature), coconut oil and honey. Lastly, add in peanut butter and mix well. Combine dry mixture with wet ingredients and mix well, adding in cranberries into the dough. If mixture is too dry to roll into small balls, add a teaspoon or two of water to mixture. Flatten each ball on cookie sheet and take it to preheated oven at 350 degrees Fahrenheit for 8 to 10 minutes or until edges are golden. Remove from pan and let it cool completely before serving and or storing it in airtight container for up to 5 days. Note, if you are watching your sugar intake, eliminate the honey, no substitution needed. We tried the recipe without it and it works perfectly! It’s just a bit less sweet, but still delicious! “I am starving! I feel like I could eat a horse!” Many of us have sympathized with this feeling at one point or another. It’s that feeling of hunger that grows uncontrollably until you are able to find something to eat. Your metabolism is so low on energy that you are unable to concentrate; your stomach is growling, and all you can do is focus on where your next meal will come from. That is the description of physical hunger. This type of hunger is influenced by your brain, liver, fat tissue and hormones. True physical hunger usually happens when you haven’t eaten for at least five hours. It is not however to be confused with psychological hunger. This type of hunger is when your inner voices convinces you that you’re hungry even though your body doesn’t need energy at that particular time. Different circumstances can trigger psychological hunger; one example is the availability of food. Consider this: you’re at work, and only after your lunch, someone offers you a piece of cake. Maybe you may turn it down at first, but the smell and the fact that it is on the table next to you slowly triggers your mind to convince you that you are indeed hungry, and that piece of cake will hit the spot! Habit is another culprit in psychological hunger. You always eat at ten o’clock in the morning since it is your designated snack time. It doesn’t matter if you’ve had a larger than usual breakfast that day and didn’t have time to get to the gym as you normally do at six am prior to work. One last example, although there are many others, for psychological hunger trigger is the emotional eating. It is perhaps the most common one of all. You may use food to counterbalance negative things that happen during your day, or you eat to celebrate an event. Unfortunately, those instances are usually times when your body doesn’t need energy, but your mind tells you it’s time to eat! There are ways to slowly work on yourself to recognize cues that distinguish between both types of hunger and allow you to achieve balance and mindful eating. One of them is to plan your meals for the day. Structure helps you better adhere to a plan. Pause before eating and ask yourself if you are eating because you are hungry or because it is what you always do at that time. Routinely identifying patterns will allow you to come up with a better game plan.. That’s a mixed metaphor. This is not to say you shouldn’t enjoy some of life’s pleasures in the form of delicious treats! Just be aware of when you’ll be eating them, and make them a part of a meal. And always, watch your portions. The problem is not the chocolate cake but the size of the slice, and usually the extra scoop of ice cream that goes along with it! Making your favorite treats part of the meal allows you to truly enjoy them without any guilt! They become a part of your meal plan. These Breakfast Banana Peanut Butter Muffins have many of the making of a healthy breakfast. They have a dose of fruit, protein, healthy fats and a touch of sweetness. Make them in a large muffin pan or a smaller mini-muffin pan for even better portion control. It is much easier to practice balance and mindful eating when you add Once Again Nut Butters to your routine. Protein and healthy fat create satiety, and that is exactly what you are looking for in your food. You want your food to work for you rather than you working for your food! Combine mashed bananas and Once Again Peanut Butter in a large bowl. Once well mixed, add in milk, coconut oil, honey, egg and vanilla extract. In separate bowl, mix wheat flour, baking soda, baking powder and cinnamon powder. Now slowly add in dry ingredient mix with bananas mixture and slowly mix just until well combined. Fill muffin tins three quarters of the way full and place in an oven pre-heated to t 350 degrees Fahrenheit for 20 minutes or until golden on top. Serve them warm or store in airtight container for up to five days.